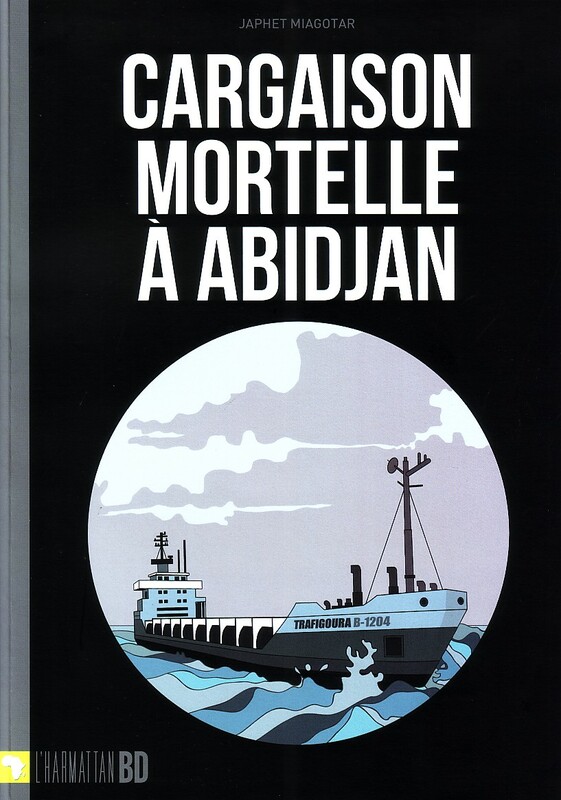 As the title Cargaison mortelle à Abidjan (2012) and the cover image of a cargo ship with the word Trafigoura (an obvious modification of Trafigura) on it suggest, this bande dessinée is inspired by the ecological disaster and international controversy of the 2006 Probo Koala affair. In the avant-propos, Cameroonian cartoonist Japhet Miagotar cites this deplorable series of events as the inspiration for his bande dessinée, explaining that the Probo Koala affair and its aftermath are highly symbolic of the ways in which certain multinational corporations view the African continent. In August of 2006, the Probo Koala, a cargo ship registered in Panama, entered the port in Abidjan, Ivory Coast after having already attempted to dock elsewhere in Europe and Africa (including Amsterdam and Lagos) in order to dispose of a large quantity of toxic waste from the Dutch-based shipping company Trafigura. The Probo Koala’s brief stay in Abidjan lasted as long as it took local subcontracted workers to unload the hazardous materials that were then discretely dispersed throughout the city. Within weeks, tens of thousands of people were treated for exposure to chemical waste and the dumping eventually led to over a dozen deaths. While Dutch and Ivorian courts unsuccessfully brought criminal charges against Trafigura executives for illegally dumping toxic waste and knowingly trying to cover it up (which, ironically, led to Trafigura attempting to bring a libel cases against British lawyers and news outlets), it was not until 2010 that Trafigura was forced to pay a fine, having finally been found guilty. In the interim, though Trafigura denied all liability, the company settled out of court with the Ivorian government for a sum of $198 million to clean up the toxic waste and while Trafigura employees were never convicted, the Ivorian subcontractors were tried in Abidjan and those overseeing the disposal of the waste throughout Abidjan were sentenced to up to 20 years in prison. This contemptible treatment of the African continent as a dumping ground for industrialized waste and the blatant inequity between those actually convicted of crimes (African subcontractors) and those acquitted of crimes (Trafigura) constitute the driving force for Miagotar’s Cargaison mortelle à Abidjan. The tenth installment of the Harmattan BD series directed by Christophe Cassiau-Haurie, Cargaison mortelle à Abidjan reveals Miagotar, recipient of a 2008 Africa e Mediterraneo award—as a masterful storyteller who blends a distinct visual style with relatable characters thus rendering the complexity and scale of the Probo Koala affair approachable for the average reader. In addition, embedded in Cargaison mortelle à Abidjan is Miagotar’s desire to produce a decidedly African bande dessinée both at the level of form and content. That is to say, Miagotar’s visual aesthetic coupled with the choice of subject matter and narrative strategies present readers with an exploration of the Probo Koala affair from the point of view of the African continent. In his article “L’Anthropologie au cœur de la bande dessinée: Pertinence d’une bande dessinée africaine avec des personnages issus de la statue africaine,” Japhet Miagotar asks whether the tendency among African cartoonists to imitate mainstream visual influences—specifically those of American Comics, Japanese Manga, and Franco-Belgian Bandes Dessinées—is satisfactory and critiques the perception of African bandes dessinées as little more pedagogical, didactic, exotic, and proverb-laden stories. Though Miagotar admits these types of African bandes dessinées have the advantages of conserving, promoting, and spreading oral traditions, he goes on to assert that they simultaneously have the effect of reinforcing exotic stereotypes of Africa already in circulation in the West. As an alternative, Miagotar praises the benefits of revisiting traditional African art forms and argues that such an approach would generate a visual diversity in African bandes dessinées that is inspired by and reflects the diversity of local cultures in Africa. As a practical example of this approach, he describes his intricate technique for rendering three-dimensional African statues into two-dimensional drawings for his bande dessinée characters. A cursory glance at Cargaison mortelle à Abidjan might suggest a contradiction to Miagotar’s main argument that African bandes dessinées should look to other African arts for inspiration as a means of avoiding reinscribing exotic stereotypes due to the highly geometric and icon-driven visual character of the bande dessinée. Indeed, the lack of shading, the use of matte colors, and the choice of matte black and white for the characters in conjunction with the ostensibly unchanging nature of the statue-inspired characters would seem to promote an exoticized representation of Africa. However, Miagotar’s aesthetic—the result of studying Fang sculpture and culture and of a reflective appropriation and adaptation of Fang sculpture—has the dual function of presenting readers with a visually innovative bande dessinée and generating a genuine interest in traditional African arts. For Miagotar, the specific choice of Fang sculpture and his anthropological and philosophical inquiry into how to transform the three-dimensional object into a two-dimensional drawing also necessarily includes a formal analysis of the complexity of Fang sculpture and, consequently, an appreciation of Fang culture. Moreover, reading through Cargaison mortelle à Abidjan, the reader recognizes the extraordinary expressiveness and dynamism of the characters that Miagotar achieves through an intelligent and insightful use of framing, scale, body language, color choice, and composition. Similarly, just as his deft appropriation and transformation of Fang sculpture seeks to move beyond an overly simplistic view of African art as little more than fetishes, Miagotar’s narrative choices work to humanize the Probo Koala affair, focusing specifically on the particularly human desires (including greed, lust, and vanity) of those (mainly in Europe and on the cargo ship) who knowingly plotted the dumping of toxic waste in Abidjan. Indeed, in its portrayal of those responsible for the dumping, this bande dessinée enacts a kind of symbolic justice. Cargaison mortelle à Abidjan, as a result, invites readers to delve beyond the surface of things—in this case both African art and international controversies—in favor of more socially and culturally conscious understanding. This entry was posted in BD Reviews and tagged bande desinée, Cargaison mortelle à Abidjan, L'Harmattan BD, Miagotar, Probo Koala by mbumatay. Bookmark the permalink.